The architectural design of the house is at high practical and functional standard using the best material of both the thai and western construction principles. The house set in lush garden with a large covered area and two large pools which is common area with the other in the development. 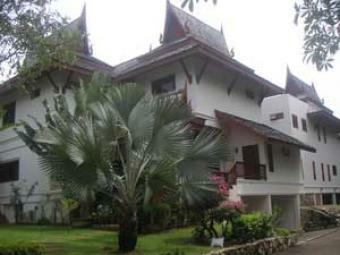 It is located at the quiet lane of Rawai beach with easy access: 20 minutes drive to Phuket town. 5 minutes drive to cape. 40 Km. drive to airport and 5 minutes walking distance to white sand and blue water of Rawai beach, restaurants and shop. The property has approximately 478 sq .m live area. It offer you a superior quality living. The innovative concept of the whole area make your dream house come true. Every area is designed to minimize the distance between the room and facilities to maximize space. It is a three store house with one master bed and three guest rooms. Living room, dinning room, kitchen, office, Sala, terraces, six bath rooms, Landry room, storage room and covered parking which is can accommodate two vehicles. One bed room located at the first level and three more bed room at third level of the house . One master bed room with its own sophisticated bath room with a very relaxing Jacuzzi and one more guest room that have bath room with Jacuzzi which immaculately maintained. The glass walls are use at the living room and the dinning room to display the breathtaking nature and brilliant seascape of lush tropical garden view. Finest materials are use in fully fitted kitchen with lift that shutters through the master bedroom. 1 private swimming pool ( with jacuzzi ) = 27 sq.m depth = 1.35m. 1.) 254 sq.m, depth 1.6 m. 2.) 180 sq.m depth 1.40 m.